RISMEDIA, March 15, 2010—(MCT)—Instead of playing the trade-up game, more homeowners are staying in their homes, upgrading kitchens and baths and building additions to accommodate their needs instead of moving into a bigger house, but there are also some early signs of an improving real estate market, according to a new survey of architecture firms. More architects say they’re seeing demand for and inquiries about home-remodeling projects, including kitchen and bath upgrades and home additions. And an increasing percentage of architects say business conditions in the first-time buyer and affordable home market also improved in the fourth quarter of 2009, compared with the fourth quarter a year earlier, according to the American Institute of Architects’ Home Design Trends Survey. The survey of 500 residential architecture firms is conducted each quarter. A net 28% of architects responding to the survey said they’re seeing greater interest among homeowners for kitchen and bath remodels, up from -16% a year ago, and a net 21% said demand for additions and alterations is improving, versus -14% a year ago. The survey figures are computed as the percentage of respondents reporting an improvement in business conditions minus those reporting a decrease. Meanwhile, a net -4% of the architects surveyed said the market for homes for first-time buyers is improving, up from -65% a year earlier. A net -31% said the market for move-up homes is improving, compared with -71% a year ago. “It’s still too early to think the residential market has fully recovered, but there are two encouraging signs—overall business conditions are far better than they were a year ago at this time, and we are seeing improvement in those housing sectors that need to lead a broader improvement in the housing market: remodeling and alterations of existing homes, and at the entry-level of the new construction market,” said Kermit Baker, chief economist of the American Institute of Architects. Baker said homeowners are making improvements thoughtfully, not banking on recouping the entire cost at resale or over-improving with upscale features as they might have several years ago. And projects are typically smaller in scope these days. “The mentality is evolving that bigger isn’t better for my home, from an investment perspective,” Baker said. As for first-time home buyers, Baker said that conditions are likely improving due to the first-time home buyer tax credit, low mortgage rates and the ability of these first-timers to buy a home without having to sell an existing home first. 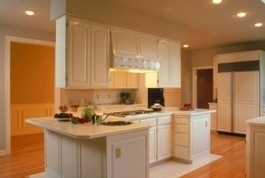 For the most part, kitchens are being upgraded with practical improvements and features to make the space more usable. “A lot of the upscale stuff, like double appliances—two dishwashers or two refrigerators—or over-the-top appliances seem to have disappeared,” Baker said. -Computer area/recharging stations, dedicated to such tasks as recharging laptops, cell phones and PDAs. The same desire for practicality and less glitz can be found in the bathroom. People are moving away from steam showers and towel-warming drawers and racks, and instead focusing on features that will help them better control their utility costs, Baker said.